(York, Pa., Feb. 27, 2019) - The York Revolution announced the signing of three more players for the 2019 season, with the return of Major League veteran second baseman Alexi Casilla and right-handed pitcher Troy Terzi, along with the addition of right-handed reliever Jose Ortega. The signings were announced by Revs manager Mark Mason live on Tuesday night’s airing of “Revs Hot Stove Weekly presented by Shipley Energy” on SportsRadio 1350 WOYK. Casilla enters his third season in York boasting the second-highest career batting average in Revs history at .344 in 170 games. The switch-hitter racked up a .358 average in 62 games in 2017, a mark that would have led the Atlantic League with enough plate appearances to qualify. He followed that by batting .336 in 108 games last season, ranking fourth in the league and finishing just two points shy of the top spot while placing fifth-highest in a season in franchise history. Casilla also ranked third in the league with 142 total hits while adding 20 doubles, three triples, three homers and 16 stolen bases. 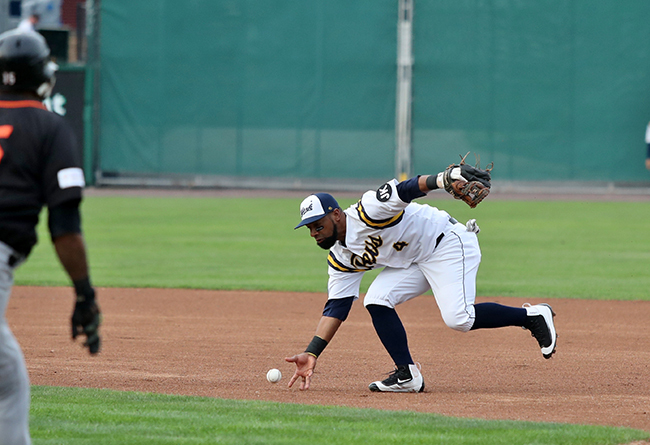 The slick-fielding second baseman was selected to the Atlantic League’s Red, White, and Blue All-Defensive Team after leading the circuit with a .983 fielding percentage, highest by a second baseman in Revs history. The 34-year-old enters his 16th professional season and brings nine years of big league experience to York. Originally signed by the Los Angeles Angels in 2003, Casilla was traded to the Minnesota Twins in 2005 in a deal that sent pitcher J.C. Romero to Anaheim. Casilla quickly rose through the Twins system, making his Major League debut in 2006. He would go on to play more than 500 games for the Twins over the following six seasons, hitting an even .250 in his career with Minnesota. His best season came in 2008, when he hit .281 with seven home runs and 50 RBI and led the American League with 13 sacrifices bunts. In the 2009 AL Central tiebreaker game, Casilla hit a walk-off single in the bottom of the 12th inning as the Twins defeated the Detroit Tigers, clinching the final playoff spot. Casilla also played for the Baltimore Orioles in 2013 and 2014 and is the all-time Major League leader in stolen base percentage with an 87.9% success rate. Terzi returns for his second pro season after spending his rookie campaign in York. The Keystone College alum debuted with three shutout innings vs. New Britain in his pro debut on August 16 and was one out away from his first career victory before rain forced a postponement in what would have been his second official start. Terzi eventually earned his first victory in his next trip to the hill on August 26 vs. Southern Maryland, and went 1-0 with a 5.78 ERA in four starts, walking just four and striking out 16 in 18.2 innings. The 24-year-old allowed two runs or fewer in two of his four outings. Ortega returns to the Atlantic League after a solid 2018 season with the Road Warriors, posting a 4.47 ERA with two saves in 47 relief outings after appearing in three games early in the season with the Sugar Land Skeeters. Ortega has Major League experience, having totaled 14 appearances with the Detroit Tigers from 2012-14. The 30-year-old owns a 3.86 ERA in 307 appearances over his minor league career, all but two of which have come in relief. That includes four seasons at Triple-A Toledo in the Tigers system and time at Double-A with the Colorado Rockies. Perhaps his best season came in 2013 when the Venezuela native went 4-3 with a 1.86 ERA and four saves for Toledo along with posting a 3.86 ERA in 11 outings at the big league level. The Revs now have 12 players signed for the upcoming season and will continue to announce additional signings each week on “Revs Hot Stove Weekly presented by Shipley Energy” on SportsRadio 1350 WOYK. The next episode airs on Tuesday, March 5 at 6:30 p.m. immediately following The Baltimore Baseball Show with Dan Connolly of The Athletic Baltimore, and can also be streamed live on woyk1350.com and The New WOYK app.